If you are a member or reglar attender at Family Bible Church, you will be receiving a letter in the mail from me with much of the information below and so may find this post redundant. However some of you on our subscriber list are friends of Family Bible Church who are not able to attend with us regularly but still have an interest in seeing our ministry grow. I am writing to you to keep you informed on matters important to us. For the past three years God has graciously provided a place for us to hold worship services at Cambridge Golf Club. During this time we have established our core values, bylaws and received 25 families into church membership. Our church exists to glorify God through teaching his Word, supporting the growth of families, praying together, and believing and sharing the gospel of Jesus Christ with those around us and around the world. This is a critical time for Family Bible Church. Cambridge is a beautiful and sufficient place for us to hold worship services, but we are limited in what we are able to do there beyond that. God has provided land on which we can construct a more permanent church home. In October of 2013 we purchased 13 acres immediately adjacent to the stadium complex at the new North High School without incurring debt. A few months ago our elders called together a building committee to begin exploring what it will take to occupy the land that the Lord has given us. Our building committee’s task was not unlike that of the 12 spies God directed Moses to send into the land of Canaan before the sons of Israel were to invade and take possession of it. The building committee collected bids from several architectural engineering firms for the initial stage of site preparation and conceptual church design. They selected Kinetic Church Builders, a local church design company with a good reputation among churches in our area. Over the past two months, our elders, building committee and Kinetic have been meeting to determine what kind of building would best serve our church’s needs for the next chapter of our life together. We took into account all that we might hope to do in the foreseeable future (if the Lord wills, recognizing that none of us can see very far) and therefore produced a long-term “master plan” for a basic church design. This design is broken down into several stages, beginning with a modest facility that can be expanded as our needs and resources grow over the years. However, you know what comes next in our biblical analogy. The report of the Israel’s spies also included numerous giants (“Nephilim”) and fortified cities who would oppose their occupation of the land God had given them. In our case, the opposing forces are the financial costs of building a new church home on the land God has given us. They are large and compared to our own resources “we seem to ourselves like grasshoppers, and so we seemed to them” (Numbers 13:33). One important goal of our design process was to determine the total square feet we need to serve our purposes adequately so we can arrive at an estimated cost. “Stage one” is 8,200 square ft. which will cost approx. $1,243,000, which includes $218,000 for site development. That is a “Nephilim” sized number! It is a huge number compared to the size and resources of our congregation. Nevertheless, our elders and building committee, courageous men like Caleb and Joshua of ancient Israel, agree that we should surely occupy the land God has given us and trust him to provide the resources for us to do so. Our people are praying and asking God to direct them in what they are able to give cheerfully and sacrificially. But construction costs are high and our people are relatively few. 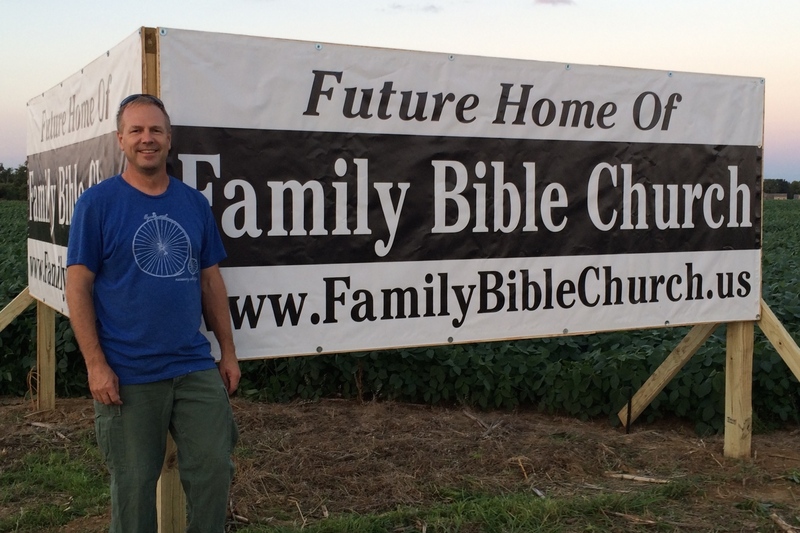 If God has been laying it on your heart to help Family Bible Church build its first home by giving generously, now would be a great time to do that. On August 10 our church will collect gifts and pledges from our families for the first stage of construction. If you desire to help us, please send checks payable to Family Bible Church, PO Box 141 Inglefield, IN 47618-0141 and mark the memo line “Building Fund.” If you wish to give monthly, please let us know that and the duration you intend to give. Or, if you desire to give by some other means, please contact us. God’s Word tells us that he “is able to do far more abundantly than all that we ask or think” (Ephesians 3:20). I am glad that is true because, though it is a small thing for God to provide the resources for us to build a home for Family Bible Church, it seems to me abundantly more than I could ask or think. I am confident that God will grow our faith considerably in the process. Thanks for taking the time to read about this! “And my God will supply every need of yours according to his riches in glory in Christ Jesus.” (Philippians 4:19). FBC Anniversary Picnic this Sunday! Service at Kingmen’s this weekend!